Does your tot throw and still use a baby bottle? My dad with my son, JJ, at age two. My 15-month-old loves to throw things! I know it's a phase, but I would like to know how can I stop him from making this into a bad habit? Whatever he has on hand, no matter if he picks it up on his own or someone hands it to him, he will just throw! What should I do? Also, he is still drinking water from a bottle. The other day he rejected a sippy cup and a straw cup when he felt that it was not his usual teat. Should I go directly to introducing him to drinking from a cup? Throwing: believe it or not he will outgrow it in a few months. Why? Because he will move on to another skill! Like kicking--just kidding! So until then, take out objects (or put them up high) that are not safe to throw, and put out more soft objects, like stuffed animals, bean bags, beanie babies, soft books (like the kind you can put in the bath--plastic, or the fabric ones for infants)... Also, if you give it more attention and energy, instead of less attention or even ignoring it, he will see that is a way to push your buttons when he is older, like age two and three. And when he is at the height of tantrums (age 21 months) he may throw objects as part of his tantrum if he knows how upset you get--in hopes of getting his way. And maybe you have a future star-baseball pitcher in your family, or basketball player! He may just be an amazing sports-star in the making! So look at it that way! Bottles: it sounds like they have become an attachment object... so tread carefully. Don't give him a bottle between meals, unless he needs soothing. As for cups, give him both at meal times (a cup of juice or milk and a bottle of water) and let him decide... Sooner or later he will choose the cup because he will start to develop that skill (and thus want to repeat it), as well as he'll notice everyone else uses a cup and babies use bottles and he won't want to be seen as a baby (by age three or so). 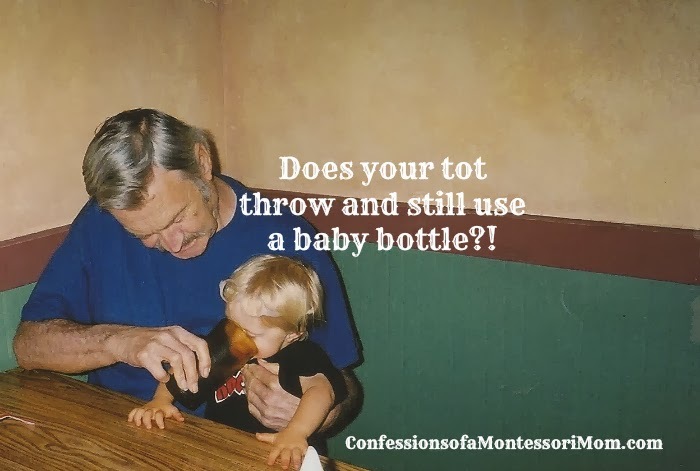 Give it time, don't be in a such rush to get rid of the bottle, let him want to get rid of it on his own--by age two or three. And keep giving him a cup and a bottle so he can decide for himself. You may also be interested in my Montessori and homeschool programs for birth to nine at Montessori for the Earth.